Here are some combinations of three letters. Try to think of a word that uses those letters in order. And you could think of words like bitmap and compass. I'll post answers whenever. 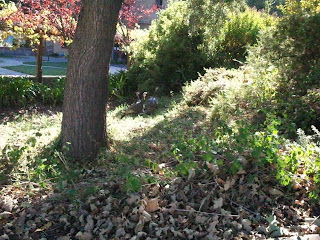 Here is a picture of some turkeys wandering around near city hall in Clayton, CA. Click to embiggen. You can't really see them that well. Last Halloween I went to my grown-up job, only to discover that the grown-ups that I work with are all more grown-up than me. In the afternoon, they brought in their spouses and shorter versions of themselves, dressed up in elaborate costumery. The shorties then proceeded to trick-or-treat at all of the cubicles, and since I am a grown-up with my own cubicle, they ALSO CAME TO MY CUBICLE. I looked to my left to see that I had anticipated this event, and I opened some bags of Tootsie Pops. 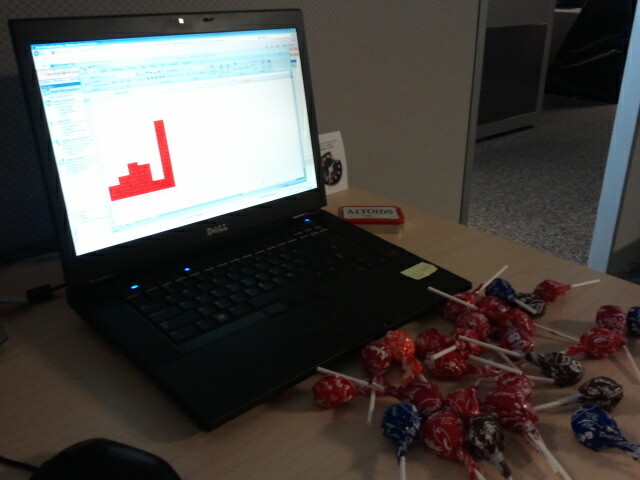 I put some handfuls of Tootsie Pops on the corner of my desk. Kids came by and said "trick or treat." 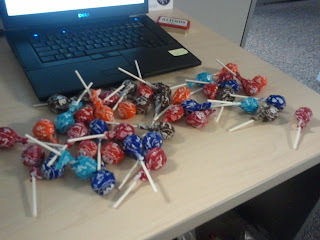 I motioned toward the pile o' Pops and said something like "What's your favorite kind?" 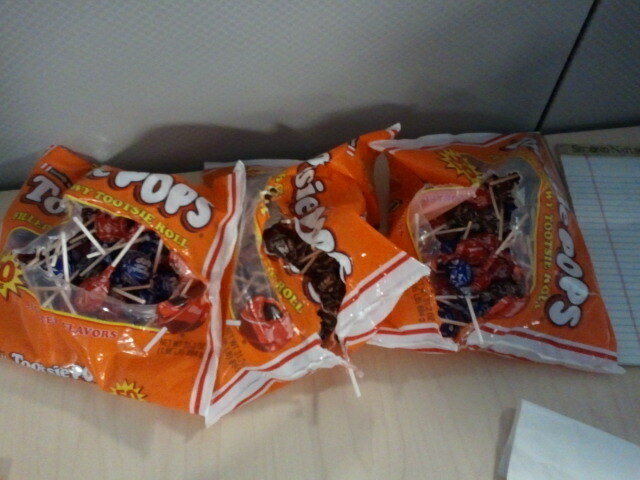 And in most cases, the kids would look over the pile and then select a Tootsie Pop for their bag. 1. I was trying to maintain an almost-equal-if-not-equal mix of all of the colors in a friendly, unbiased pile. The photos are not a good example of this. 2. I recorded what flavor they chose after they walked away and replaced the appropriate Tootsie Pops into the pile. 1. Blue raspberry was to be the landslide victor! I didn't know blue raspberry was even a flavor. It's apparently new. (or at least it was last Halloween.) It whupped all of the other Tootsie Pops' little lollibottoms. I ended up running clean out of blue raspberry ones, but I kept giving out the leftovers for hours. So blue raspberry is the most popular Tootsie Pop. Even more than regular raspberry. Raspberries aren't blue. A lot of the kids gave me sincere thank-yous. One even tapped me on the knee and waited until he had my attention before looking me in the eyes and thanking me. Sometimes Alan cannot maintain steady blogging habits. Okay, Alan never maintains steady blogging habits. Alan admits knowing about Alan's hist'ry without normal bloggy postings. Forthwith, Alan attempts anew, posting pictures, pizza flavor kneecap keyboard, chipper SpongeBob SquarePants table bucket marble dolphins. Bagel pillow. Ancient sandal jelly.